We like to try new places to eat when visiting areas we enjoy. But we also like to go back to the "tried and true" spots that offer a feeling of days gone by. Such is the desire when we go to San Francisco. 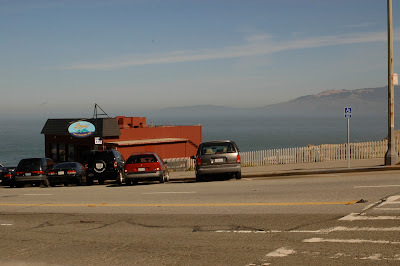 And that desire always leads us to the restaurant that overlooks the Pacific and hangs off the side of a cliff -- Louis'. We can't go to the City by the Bay without a visit to this old-style diner. It must have been sometime back in the 80's when we discovered this eatery. I think it was when we took the touristy 49-mile drive around the city and wanted to see what it was like to have a meal hanging off the side of a cliff in an earthquake prone area. 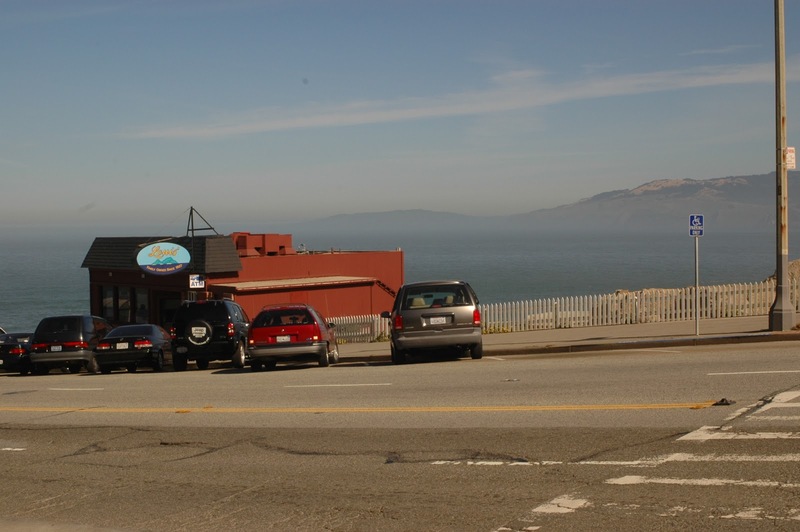 Louis' is located at 902 Point Lobos Ave., just up the hill from the Cliff House. 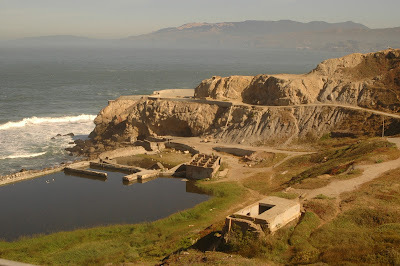 The restaurant overlooks the ruins of what use to be the Sutro Baths. When downtown, just get on Geary Boulevard, head west, and keep going and going and going. Eventually Point Lobos branches off from Geary close to the ocean and one heads down a (what else) steep hill heading toward the Pacific. Point Lobos curves to the south and turns into the Great Highway that runs for miles along the Pacific. 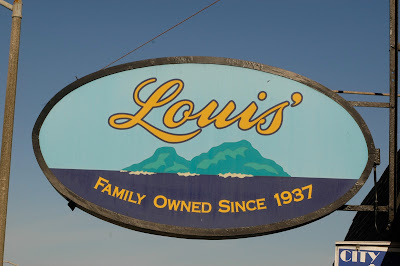 Louis' is similar to a spot in our area where we go for breakfast. The service is friendly and the food is OK. The view is to die for. 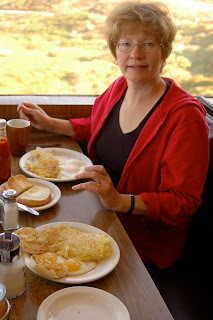 Unlike back home, they don't serve grits and biscuits with breakfast, so I end up supplementing my eggs "sunny side up" with hashbrowns and an English muffin. Another tidbit of interest. For the first 10 or 15 times we visited, we were often waited on by Rachel, an elderly English lady. She was good at her job and provided a little extra atmosphere for our visits. The last time we visited, she wasn't around. Seems that time had finally caught up to her and she retired. 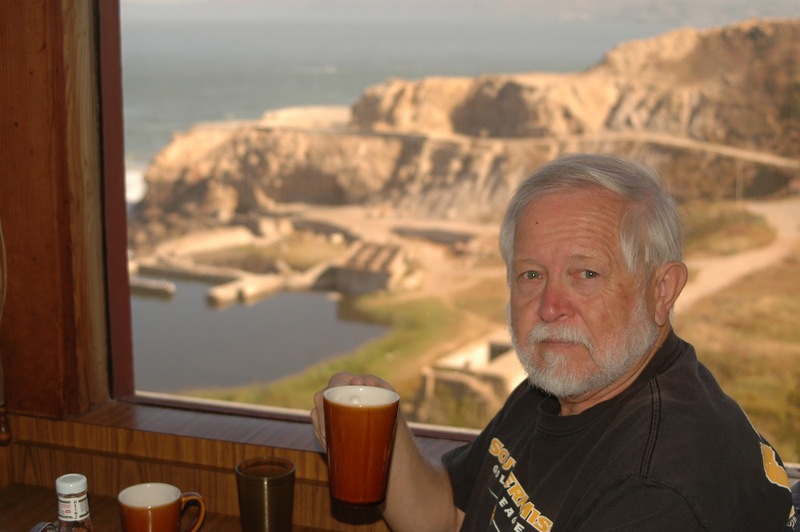 A number of years ago the National Park Service, which owns the land, put out a "trial balloon" concerning the possibility of doing away with the eatery. Needless to say, the uproar was such that Louis is still around. The Hontalases family, which has been operating the landmark for 73 years, just last year won a 10-year lease on the property beating out three other bidders. We hope that the family can continue on for as many years as we return to the City by they Bay. Louis Hontalas was my grandfather and the restaurant is now run by my brothers. I came across your blog looking for photos of Louis from the 1960's 1970's. Rachel is indeed now retired, but still enjoying a weekly trip out to Louis for lunch. We celebrate 75 years on February 14, 2012. Thanks for your testimonial.